As host nation, India prepares for the mega event to begin on 28th November 2018, the anticipation and excitement doubles in the sub-continent. The anticipation and excitement is palpable among hockey buffs in the country and around the world with just 100 Days to go for the much-awaited season Finale Odisha Hockey Men’s World Cup Bhubaneswar 2018 scheduled to begin on 28 November at the iconic Kalinga Stadium. While all eyes are on the Indian Men’s Team as they defend their title at the 18th Asian Games Jakarta-Palembang 2018, with their opening match against hosts Indonesia today, the team will be looking to use the momentum gained at the Asian Games to back their campaign at the Mega quadrennial event on home soil. “A Gold at the Asian Games will give the team tremendous boost for the Odisha Hockey Men’s World Cup Bhubaneswar 2018. Our countdown starts from here in Jakarta and every single player and support staff is excited,” expressed Indian Men’s Team Chief Coach Harendra Singh. Even as the host team is leaving no stone unturned in their preparations to put up their best performance in front of home audience, the host nation Hockey India along with relentless support from the Odisha State Government are working tirelessly to ensure spectators and teams from around the globe have the best experience of the event. With 16 team in the fray, World No. 1 Australia as defending champions, the event will witness 36 matches between 28 November and 16 December. Each of the participating teams will play three matches during the league stage over a span of 12 days before four cross-over matches that will decide the fate of the teams to book their place in the top eight stage. The general tickets for the event are already on sale and are reasonably priced at Rs200 (East Stand), Rs 100 (North Stand) and Rs 100 (South Stand) for the Pool and Crossover matches. 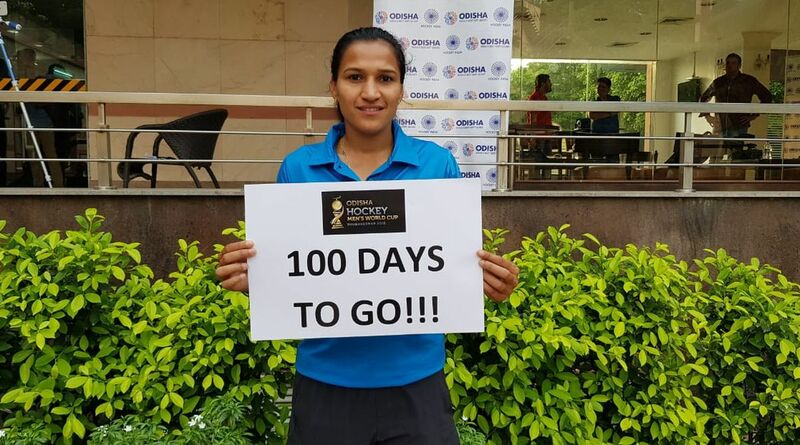 “With just 100 days to go for the Odisha Hockey Men’s World Cup Bhubaneswar 2018, everyone involved in hosting the event have been working round-the-clock to ensure every single person who arrives to be part of the event returns with best memories. There is tremendous excitement around the event and with Indian Hockey Teams doing well at the recent International events, hockey is garnering a lot of support in the country and we are expecting large number of spectators to travel for the event in November,” stated Md. Mushtaque Ahmad, Secretary General, Hockey India.